One of the many nice things about flying on Virgin America over the years has been its generosity when it comes to carry-on bag sizes. To me, that’s a nice kiss on the cheek of business travelers from Alaska Air, since one of our most frequently followed “rules of the road” is “Never check a bag!” Right? How big is your bag? Do you check it? Ever get hassled by the baggage police? Please leave your comments below. The global airline trade organization’s retrenchment on the controversial plan came on the same day that its U.S. counterpart — Airlines for America (A4A) — said none of its members planned to adopt the new IATA standards, which called for maximum carry-on dimensions of 21.5 by 13.5 by 7.5 inches. Considering the potential consumer outrage if the plan had been widely adopted, we can’t say we’re surprised that cooler heads prevailed at U.S. carriers. IATA said that there has been too much confusion about the proposal (which it calls Cabin OK) — particularly by media reports that made it sound like the standard would be mandatory and that travelers would have to rush out and buy new carry-on luggage to meet the smaller dimensions. 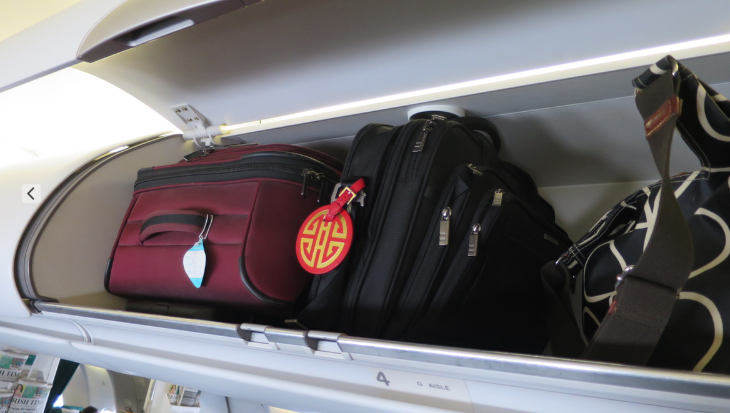 “Cabin OK is a guideline for an optimally sized cabin bag, not an industry standard,” IATA said. “Cabin OK does not seek to define a maximum size for carry-on bags, which is something each airline does individually. And no consumer will be forced into buying a new bag as a result of this voluntary initiative.” Nonetheless, IATA said it has “paused” the program until it can reassess the whole idea. Have you actually ever measured the dimensions of your carry-on luggage? All airlines set maximum dimension limits (length by width by depth); some of them (Spirit, Frontier) now charge passengers for overhead-stowable carry-ons, and some are getting more serious about enforcing the size limits (like Air Canada, which now won’t let bags in the cabin unless they have received an “approved” tag from airline staff). And now the worldwide airline trade organization has proposed that its member carriers to adopt uniform size standards for carry-ons — standards that are slightly smaller than major U.S. carriers currently allow. The International Air Transport Association wants the maximum carry on bag size to be 7.5″ x 13.5″ x 21.5″ — including wheels. That compares with an existing standard of 9″ x 14″ x 22″ at United, American and Delta. Southwest and Virgin America offer consistently larger bins and both have a larger bag size limit of 24″ x 16″ x 10″. Alaska’s is even larger at 24″ x 17″ x 10″. All three use this as a selling point, so I’m not convinced this new standard is going to be adopted worldwide. 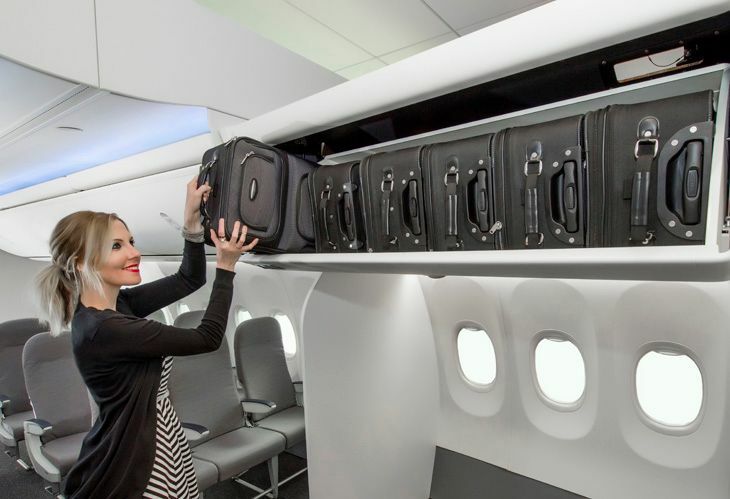 Plus, many of the newer aircraft flown by major US carriers now offer much larger bins capable of handling bags larger than these proposed limits. IATA said it selected the proposed dimensions based on discussions with Boeing and Airbus about what size bags would best fit in overhead bins. It has also started talking with luggage manufacturers about developing bags with the new maximum dimensions. The proposed new bags would carry a tag that says “Cabin OK” to let gate agents know they’re pre-approved, size-wise. Will this idea fly with U.S. airlines? With passengers? Would you go out and buy a new bag if your airline of choice requires it…or would you switch your airline of choice? And consider this idea previously mentioned in the comments here on TravelSkills: To get a grip on the seemingly uncontrollable carry-on bag issue, airlines should let checked bags fly free– and only charge for carry ons. What do you think about that solution? U.S. airlines don’t always follow the lead of their foreign counterparts, but if they decide to adopt a newly announced policy from Air Canada, it could spell trouble for passengers who rely on overstuffed carry-ons to avoid checked baggage fees. The Canadian carrier said on its website this week that it plans to start using what amounts to carry-on bag police, putting employees at airport check-in areas and security checkpoints to eyeball passengers’ bags and make sure they don’t exceed the proper size dimensions. And they’ll tag appropriate bags with a red “approved” tag. “This will make it easier and safer to stow your personal items on board, may help reduce wait times at security, and will help avoid flight delays caused by larger bags being checked at the gate,” Air Canada said. If not, the bag will have to be checked. If you make it to the security checkpoint with an oversized carry-on and get caught there, “We’ll give you a special card that will get you quickly back to a check-in agent, and then on to your departure gate,” the airline noted. The new policy will start on May 25 at Toronto Pearson and gradually be rolled out to other airports during June. How good is the warranty on your luggage? 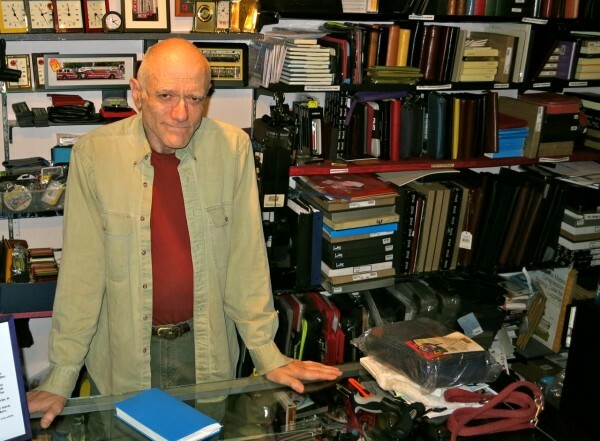 “My customer’s dog tore the zipper off a $300 carry-on bag he’d had for just two weeks,” said Lou Briasco, the owner of Michael Bruno Luggage on Market Street in San Francisco’s Castro neighborhood. “The bag was ruined, so he came back into the store to buy a replacement. Since he wasn’t traveling soon, I told him I would send it back to Briggs & Riley to see if they really stood behind their ‘no questions asked’ repair or replacement policy,” he added. If there’s anyone in the Bay Area who knows luggage, it’s the gregarious, affable Briasco, who has been the sole proprietor at Michael Bruno since 1982. Even though the store does not have a web site, all you have to do is check the hundred or so stellar ratings on Yelp to know that Briasco knows his business…and his customers. 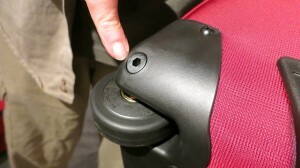 After more than 30 years in the luggage business, Briasco says that the key feature frequent travelers should look for in a new bag is a strong manufacturer’s repair or replacement policy. For that reason, the two primary lines of luggage he carries are Briggs & Riley and Eagle Creek—both, he says, have solid, time-tested warranties. 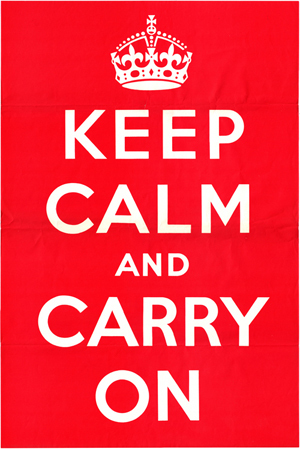 Briggs & Riley’s warranty states: “If your Briggs & Riley bag is ever broken or damaged, even if it was caused by an airline, we will repair it free of charge – Simple as that!” The warranty is good for life and does not require receipts or any other evidence that you even bought the bag. All you have to do is pay to ship it to the repair center. Briasco says that the high-end (and very popular) Tumi line has added too many exceptions to its warranty (such as proof of purchase requirements) in recent years, so he’s stopped carrying it in his store. For occasional travelers, he stocks less expensive Delsey bags, which he says are suitable for infrequent use. But you get what you pay for with its rather thin warranty that specifically rules out coverage for damage caused by airlines. 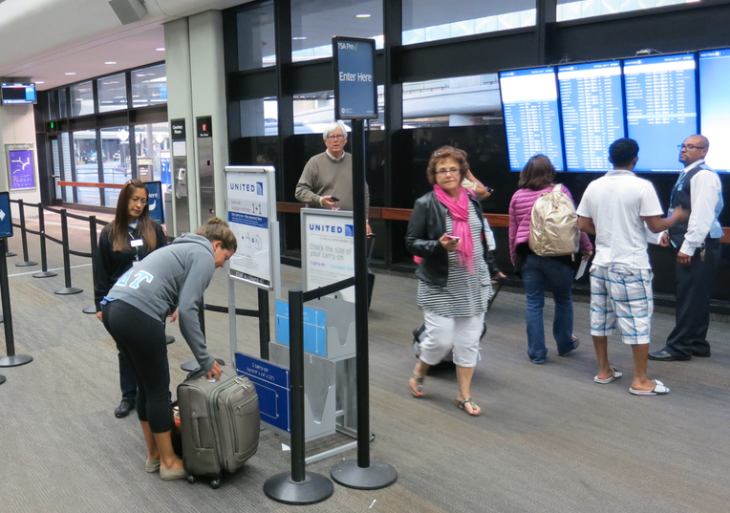 In addition to a good warranty, what should a frequent traveler look for when buying a bag? DURABILITY: Since wheels often break, even on high quality bags, Briasco recommends looking for sturdy wheels that can easily be switched out if broken. For wheeled bags, Briasco said that external frame telescopic handles result in more room inside bags. MADE IN USA? 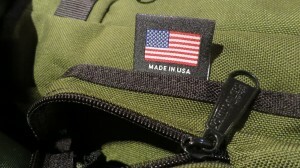 “When I started out in 1982, nearly all luggage was made in the USA. It was a sign of quality. Now, all bags are made in Asia—and that’s not all bad if the manufacturer has strict quality controls—not all of them do, and you can tell,” he said. Briasco is happy to show off features such as inverted, waterproof zippers, sturdy, low profile handles that don’t get snagged by baggage handling equipment, convenient exterior pockets, etc. HOW MUCH? “Frequent travelers should spend a little bit more money on a higher quality bag that lasts a lot longer. In the long run, they will spend less than they would having to replace cheaper bags over and over again.” he advised. 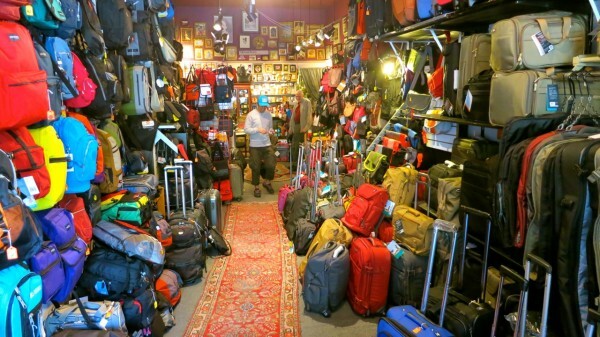 “Those who travel once per month should invest around $300 for good bag that won’t break when you really need it.” Briasco offers deep unadvertised discounts on all his merchandise. “It’s the only way I can stay in business and compete with the online retailers,” he smiled. HARD-SIDED LUGGAGE? Shiny, colorful new hard-sided bags from manufacturers like Rimowa seem to be all the rage in airports and hotel lobbies these days. However, Briasco is not much of a fan. “Most do not have external pockets, which I think are critical. Also, for the hard sides to maintain their integrity, the bag has to be packed full. If not, the sides get a little wobbly,” he said. FOUR WHEELS? New four wheeled bags, referred to as “spinners” are also very popular these days. But Briasco warns that those with small wheels are difficult to maneuver, especially on carpets. “So if you really want a spinner, check the wheels first, and try to roll it over some carpet,” he advised. You won’t find too many easily snatched black bags at Michael Bruno- check out the colors. COLOR? Think twice before you buy a black bag. “A thief will never steal a red bag at the airport—he’d be too easy to catch,” he warned. 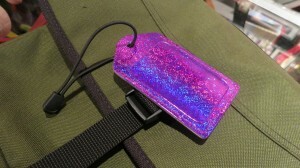 If you have a black bag, he suggests getting a very colorful luggage tag—as a matter of fact, Briasco throws in a free brightly colored tag with most high end bags he sells. Need some luggage advice? 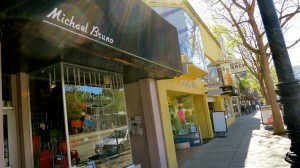 Drop by Michael Bruno Luggage at 2267 Market Street and let Lou bend your ear. You’ll get more than a piece of luggage—you’ll get a piece of his mind! The store is open Thurs-Tues between 11 a.m. and 2 p.m. But if you drop by and the store is closed, call the phone number posted on the door and Lou (who lives three doors away) will come open the shop for you. What type of luggage do you carry? Why? Do you have any good tips or advice regarding the bag you own? Please leave your comments below!